Leeds Liverpool Canal from Otley Road, Shipley. Photo: Google. A MAN rescued from a canal in Shipley in the early hours today told fire crews he had been out drinking in Leeds and didn't know how he had ended up in the water. Firefighters used a water sled to rescue the man, who was stood waist deep in the water in the canal, close to where it passes under Otley Road. The man told his rescuers he had caught a train back to Shipley after a night out in Leeds. Richard Driver, watch commander at Shipley Fire Station, said: "He was very cold so I would assume he had been in the canal for quite some time. "He was crying for help. 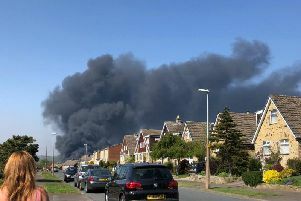 Luckily a local resident heard his cries and alerted police and the fire service. He is lucky that somebody has heard him and raised the alarm, especially at that time of the morning. "He lives in Shipley and had been out drinking in Leeds. He had caught the train home and got off at Shipley and he wasn't sure how he ended up in the canal. It appears he got disoriented." "He did thank us for getting him out of the canal. He was on the far side of the canal from the tow path and was stood at the bottom of quite a steep wall. "Two firefighters went across the canal and places him on the inflatable sled and brought him over to the towpath. "He said he had been drinking. He did appear intoxicated." Appliances from Shipley and Bingley attended with water rescue crews from Bingley, Rastrick and Ossett.